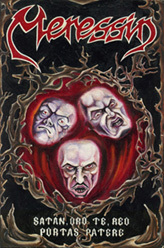 The Lithuanian metal band MERESSIN was organized in 1993 on the 6th of September in the town of Telšiai (Telshiai). There were composed 8 songs by the foundation of old black metal and they were recorded in October of 1994 and the first MC "SATAN, ORO TE, REO PORTAS PATERE" like demo was released in the beginning of 1995. This work was valued well by the listeners - the MERESSIN gained their fans. In the beginning of July of 1996 the band made 9 new compositions. The foundation of the music was still the same - black metal with heavy, thrash and occult metal atmosphere. The music and the lyrics became more professional than in the first demo. This cass. 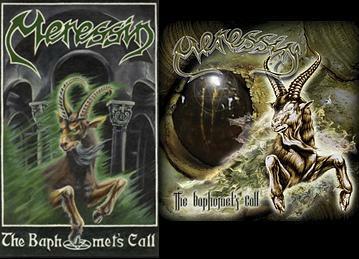 LP "THE BAPHOMET'S CALL" was released by the greatest Lithuanian music label "BOMBA Rec." The group became one of the most popular metal groups in Lithuania. MERESSIN played on one stage with THERION, TORTHARRY and other well known groups from Lithuania and abroad. 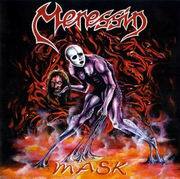 In 1997 MERESSIN recorded the new album "MASK", witch had the same ideas and the music style, like the works of MERESSIN made before. Lyrics - the philosophy of satanizm, vizious of the dark side and etc. Two songs of the album were sang in Lithuanian (after that MERESSIN decided to sing in their native tongue). In 1998 the ideas of the group has totaly changed, the music changed too and it could be called like heavy/black rock'n'roll. After these changes, members of the band decided to use folk elements in their music first in all the history of MERESSIN, also they used their native Samogitian language in their lyrics. After that MERESSIN got the name of the Samogitian group. 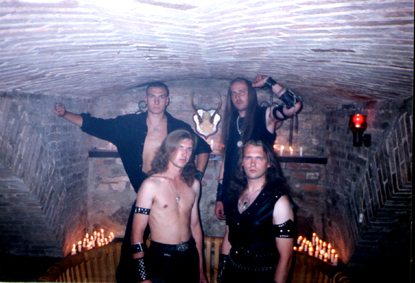 In April of 2000 the 3rd full-length album "ALKIS" (THE HUNGER) of MERESSIN was ready for the recording. It took 2 years to create this album and it showed up in the beginning of 2001 in MC and CD formats. In summer of 2001 there was made the first video in the history of MERESSIN, for the song "Ašmenys".